A printer was concerned at the risk of injury and the time taken by workers to move and change print rollers. 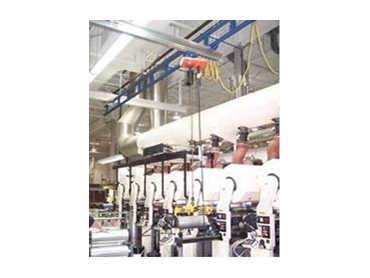 A Gorbel ceiling mounted crane, supplied by Safetech , provided the solution. The operations at the commercial printing station involved lifting, changing, and moving print rollers weighing 30kg. The work area serves two twin printing presses with a 5m-wide aisle between presses. The heavy print rollers were being manoeuvred by one person, creating high risk of injury because loads were lifted up and away from the body. Manual lifting was causing damage to the print rollers. A Gorbel ceiling mounted work station crane with an aluminium bridge was chosen to serve the two work cells. It was a GLCSLX500/250-15AL-34 with a chain hoist and custom mechanical roll lifting device. The new crane system covers both work areas without taking up floor space. Workers no longer have to manually lift the heavy print rollers, saving their backs from injury. There has also been a decrease in the amount of damaged products.